Our 2015 Architectural Tour celebrates Women Architects of San Luis Obispo. Gough is a beautiful example of Spanish Revival. The first commercial straw bale building in California at CLAIBORNE & CHURCHILL WINERY by Marilyn Farmer will give guests a unique view of sustainable design as well as an opportunity to wine taste! We will also do a drive by of Marilyn Farmer's commercial building for THE CALIFORNIA DEPARTMENT OF INDUSTRIAL RELATIONS OFFICES BUILDING on Allene Way. 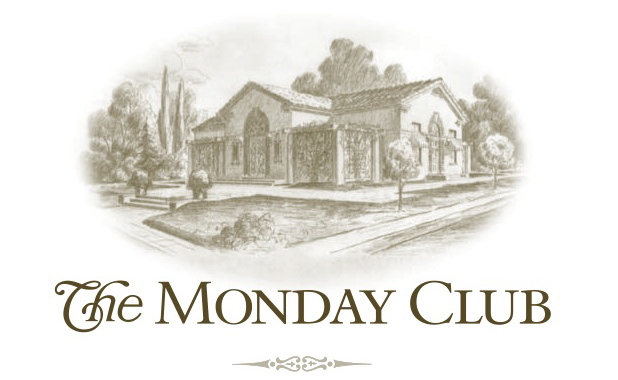 Our last stop is at our historic MONDAY CLUB OF SAN LUIS OBISPO, designed by Julia Morgan, Architect. Learn details of her designs and expertise and finish with lunch in the Garden. Count on spending 3 hours for your tour and lunch. Tour start times begin at 9 am, with the last leaving at 2:30 pm. We look forward to sharing a beautiful day in San Luis Obispo! You can read more about it in The Tribune in this feature article by Rebecca Juretic. Proceeds from this event will be used for funding our Fine Arts Awards, which reward excellence in Music and Visual Art for SLO County High School Seniors. Tickets are $45 in advance and will be available at the Del Monte Café (1901 Santa Barbara St., San Luis Obispo), SLO Consignment (181 Tank Farm Road Suite 110, San Luis Obispo) or online at Brown Paper Tickets (BPT). Credit Cards accepted at SLO Consignment or BPT. Select tickets may be purchased at the door for based on availability.